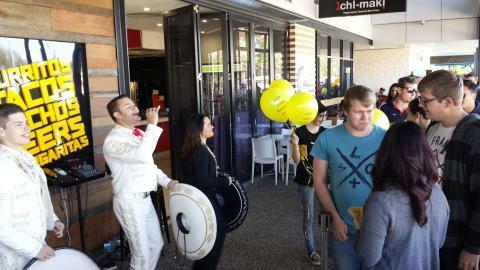 GLADSTONE residents have started lining up to get their free burrito as Mexican restaurant Guzman y Gomez opens at Stockland Shopping Centre. The restaurant is offering free burritos from 11am to 8pm. There are up to 200 people waiting for their free treat, and those queuing are being fed free guacomole and corn chips. And face painters are on hand to draw moustaches on the excited crowd - for those who are keen. The biggest crowd is expected over the lunch period from noon to 2pm. The free burrito day has become a signature event for the company, with as many as 6100 given away at the opening of the franchise's restaurant at Southbank, Brisbane. There also is face painting and a mariachi band to entertain the crowd. Franchise founder Steven Marks said the free burrito day was an opportunity for new customers to sample the business's signature menu item. "There is nothing like GYG here - the experience is about all things Latin, the food, the music, the art, and the personality and we look forward to making our mark." Which Gladstone pub has the best meals?